Dr. Meyers graduated Valedictorian from Eisenhower High School in Lawton, Oklahoma. He was awarded the Winston Churchill Scholarship and attended Westminster College; graduating with a Biology degree in 1990. In the Fall of 1990, he began medical school at the University of Oklahoma College of Medicine. During his medical school years, he was awarded the Presbyterian-Harris Research Fellowship and was a member of Alpha Omega Alpha Honor Society. After graduating, he performed his Internship in Internal Medicine and Residency in Dermatology at the University of Oklahoma. These programs also provided care for Veterans at the VA Hospital in Oklahoma City. During his final year, he was Chief Resident in the Department of Dermatology. In 1998, Dr. Meyers was accepted in the American College of Mohs Surgery (ACMS) Fellowship at Boston University. 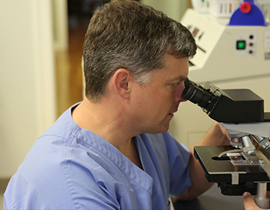 This fellowship provides an additional year of training in Mohs Surgery. His fellowship training was provided under the direction of Drs. Donald Grande and Thomas Rohrer. While in fellowship, Dr. Meyers became Board Certified in Dermatology (American Board of Medical Specialties). After completing fellowship, Dr. Meyers practiced as a faculty member in the Department of Dermatology at Boston University. In August of 1999, Dr. Meyers returned to Tulsa to begin his private practice in Mohs surgery. While in Oklahoma, Dr. Meyers has worked in solo practice. He has been a volunteer faculty member in the Department of Dermatology at the University of Oklahoma and has participated in the training of OU residents as they rotate in Tulsa. He has also been a preceptor for medical students from Oklahoma State University. He has twice served as President of the Oklahoma State Dermatological Society (2005-6, 2012-13). And in 2009, he was appointed by the Governor of Oklahoma to the Oklahoma State Board of Medical Licensure and Supervision.